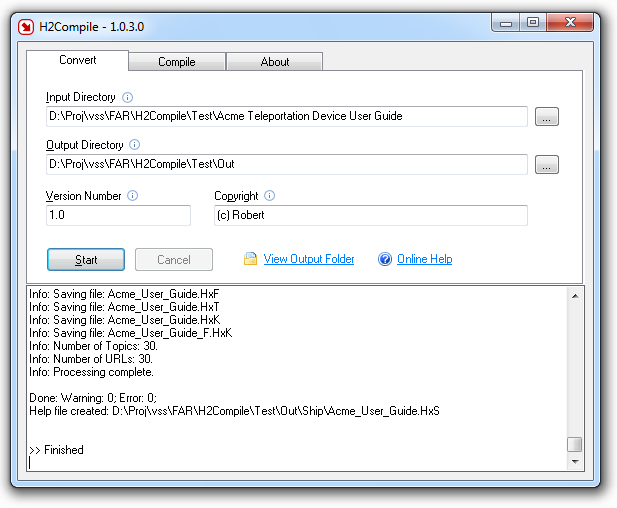 H2Compile is an MS Help 2 compiler plug-in for Author-it 5. You normally won't see the H2Compile.exe main window since Author-it runs H2Compile.exe in quiet mode via it's command-line augments. Here are the default command-line augments. See Author-it "After Publishing" settings for plug-in "Compile MS Help 2 File". The first parameter <SYS_PUBLISH_FOLDER> tells H2Compile where the input directory is. The second parameter <SYS_PUBLISH_FOLDER>\HxS tells H2Compile where the output directory is. The third parameter /q tells H2Compile to run in quiet mode (main window hidden). H2Compile copies the files from <SYS_PUBLISH_FOLDER> to <SYS_PUBLISH_FOLDER>\HxS, then converts the files (in the HxS folder) to an MS Help 2 project and finally compiles the project to a .HxS help file format. You need to manually go to the <SYS_PUBLISH_FOLDER>\HxS folder to check and retrieve the output. the \HxS\ folder will contain your MS Help 2 project source files. the \HxS\Ship\ folder will contain the log file (check for errors) and the final .HxS help file. the \HxS\Ship\ folder also contains COL_*.Hx? collection level files you will require if you want to test or ship your help. You can also run H2Compile.exe in standalone mode. The first page allows you to convert a HTML Help project (Input directory) to a MS Help 2 project (Output directory). You can optionally add version and copyright information (since MS Help 2 .HxS help files support this meta data). When you press Start, your HH project is copies from the Input directory to the Output directory and converted into a MS Help 2 project. Then the project is compiled into a .HxS help file. The Compile page is just for compiling an existing MS Help 2 project. For example you may find your MS Help 2 project (in the output directory) contains compile errors. You can try and fix the errors then attempt a recompile. The About page tab simple displays version and license information.